“Foreign Office staff invited to wear hijab for the day: Civil service accused of promoting ‘oppression of women’ after giving out free headscarves,” by Ian Drury, Daily Mail, February 7, 2018: Mandarins at the Foreign Office invited staff to wear Islamic headscarves for the day, claiming they symbolised ‘liberation, respect and security’. The department was accused of backing the ‘institutional oppression of women’ by giving away taxpayer-funded headscarves at a walk-in event to mark World Hijab Day. The event was held as women in ultra-conservative Iran burned their headscarves in protest at being forced to wear them or face arrest and prison. Tory MP Andrew Bridgen said: ‘I’d like to know whose bright idea this was. It is ridiculous, a complete waste of taxpayers’ money and not the business of a Government department. ‘I can’t see the Foreign Office promoting Christianity or the handing out of crosses.’ An internal email to Foreign Office staff said the event was taking place on February 1 between midday and 2pm inside the department’s headquarters at Whitehall. 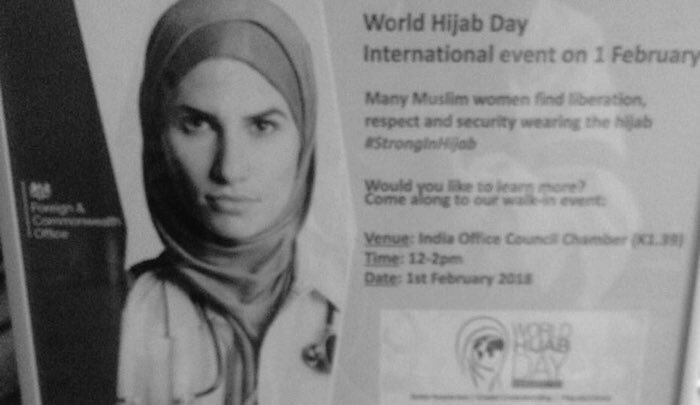 It read: ‘Would you like to try on a hijab or learn why Muslim women wear the headscarf? Come along to our walk-in event. Free scarves for all those that choose to wear it for the day or part of the day.